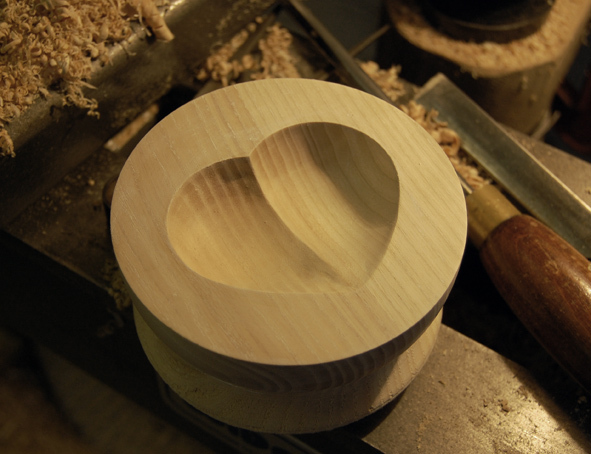 Here’s an idea for a special Valentine’s gift; a bowl with a heart shaped hollow. 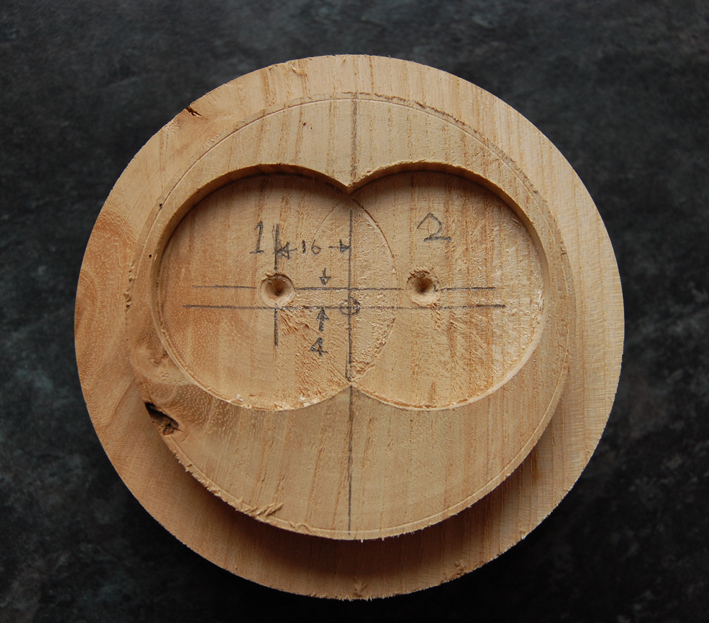 The project involves scooping out 2 circular hollows, both off centre and finishing the heart shape with a bit of hand carving. I used ash, not the best material for carving but I rather like the way the grain can be picked out with liming wax. I’ve made a sketch showing the dimensions and method I used. 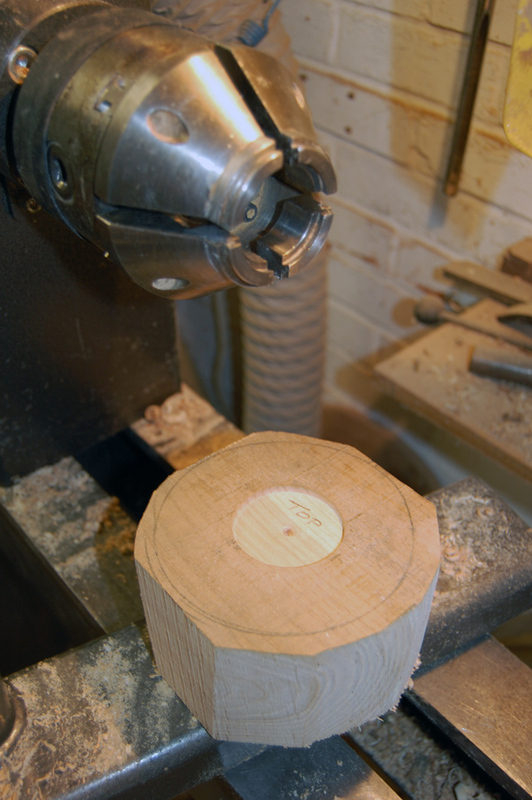 I cut a shallow recess in my blank in what would become the top using a Forstner bit in a pillar drill. This was mounted in o’Donnel jaws in expansion mode to allow me to turn a cylinder about 120 mm diameter. The bottom face was turned as flat as possible and the centre marked. A 100 mm diameter step was made around the edge for mounting in compression mode in the largest jaws I have. Reversing into the large jaws, the top surface was skimmed flat, removing the recess. 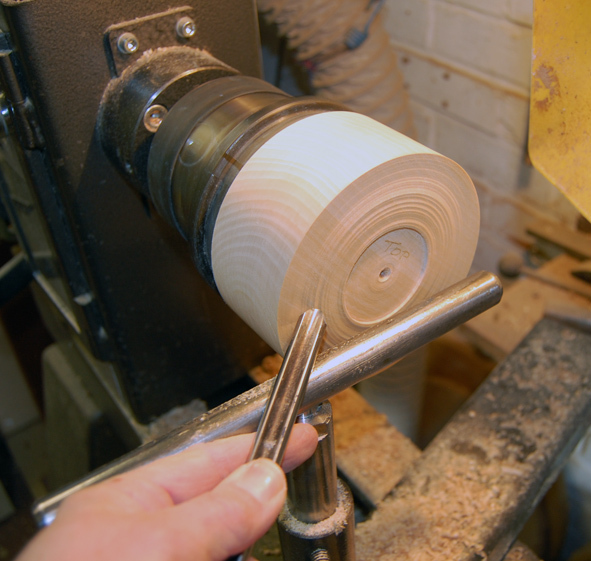 Off the lathe, the bottom was marked up with 2 off-centres 32 mm apart and 4 mm above the true centre. Think about the grain direction when marking up. 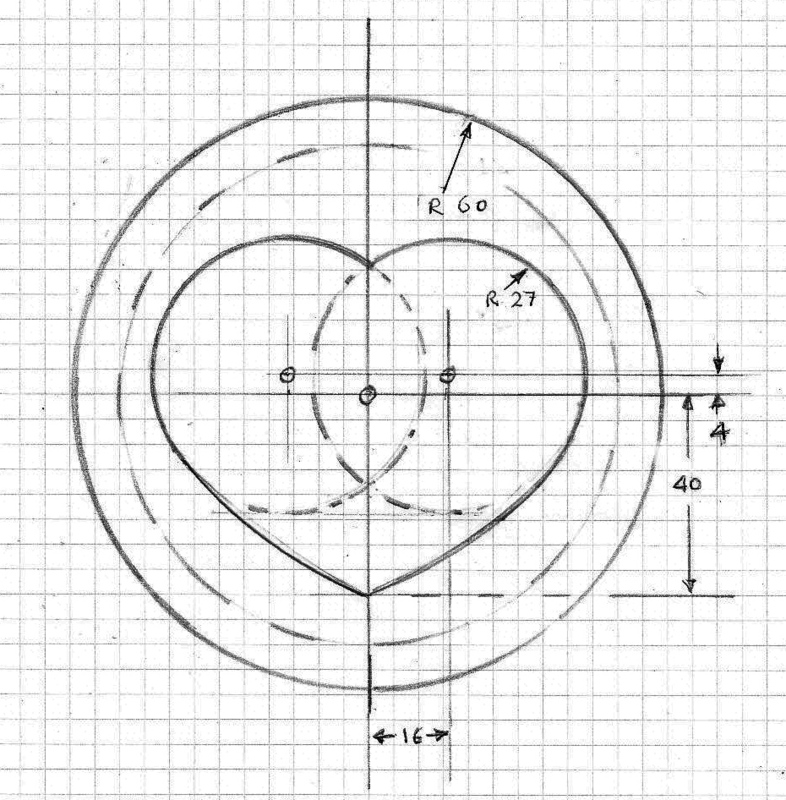 Make it at right angles to a line drawn between the 2 off centres and you will be carving the bottom V of the heart with the grain. Shallow recesses were drilled at the 2 centre points on the pillar drill with the same Forstner bit. These, of course, break into each other but there’s enough of each circumference left to grip. 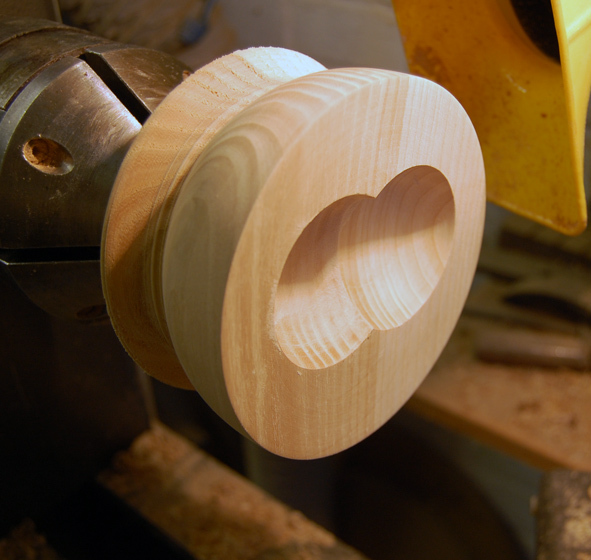 The blank was then mounted in the o’Donnel jaws in off-centre position 1 and a 54 mm diameter hollow scooped out with a bowl gouge. Re-mounted in position 2, the second hollow was scooped out making sure the diameter and depth were the same as the first. This is trickier than the first because the bevel can’t rub all the way round. You have to be positive with the tool and not let it kick back. Cutting a groove at the edge of the hollow with a parting tool might help and I confess to finishing shaping with a round nosed scraper. Then I drew the bottom “V” of the heart and carved it away using a chisel. 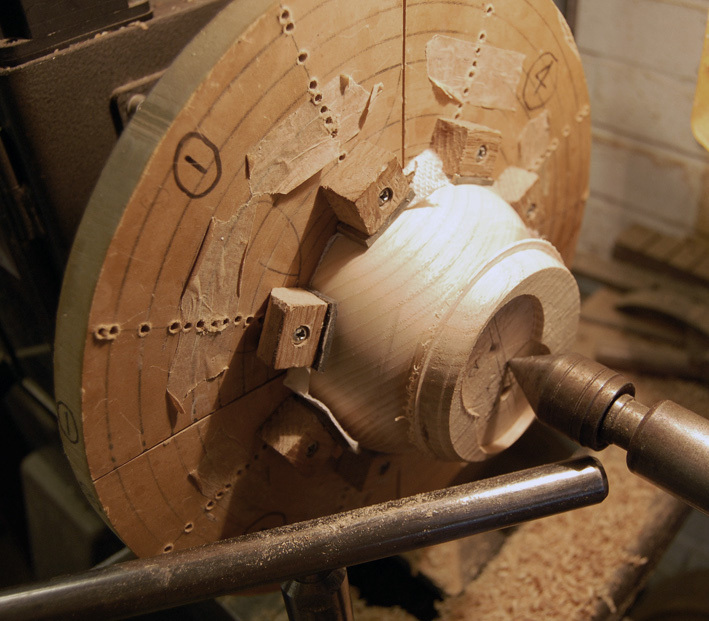 A proper curved carving tool makes a better job of it but you can manage without. 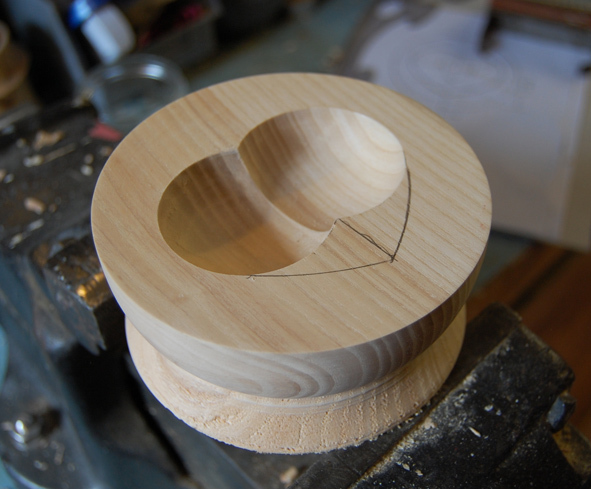 The inside of the heart can be sanded with a small power sanding disc and hand sanding. Care must be taken not to damage the top edge. 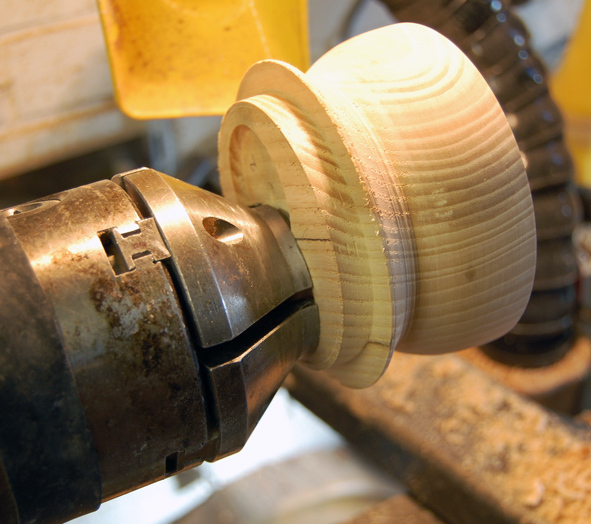 I then reversed the bowl, gripping by the rim with soft jaws to finish the bottom. I like my bottoms round and wobbly but you may have other preferences! 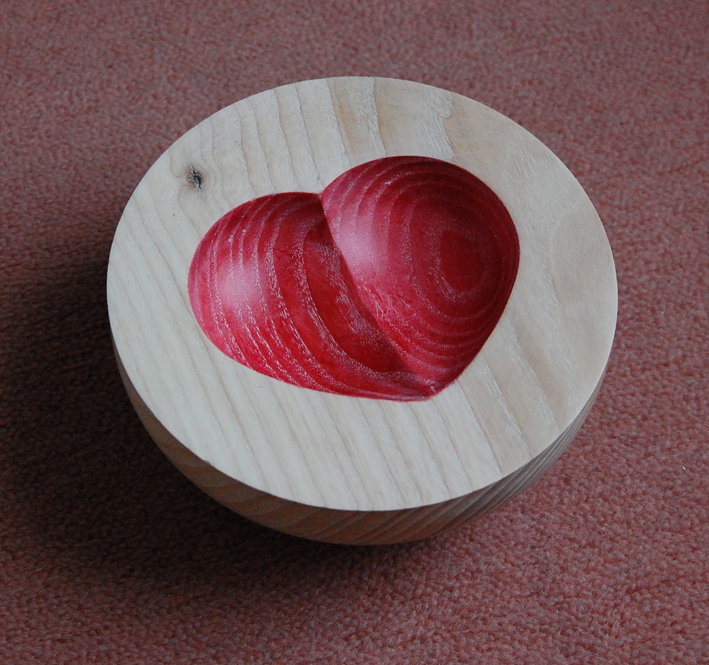 I stained the hollow heart shape red and finished with liming wax then clear wax, all off the lathe.